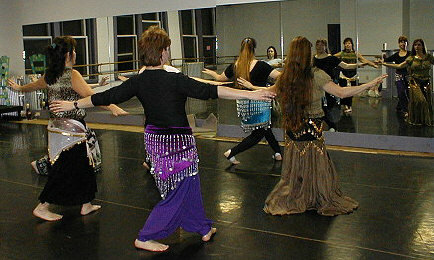 Mira's advanced class begins with a warmup and stretch, continues with drills of advanced techniques, layering, and work on choreographies, zills, and veil, and ends with free dancing and a cool-down. 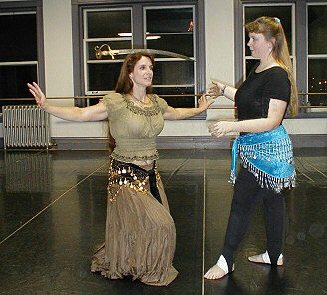 The focus of Mira's advanced class is refining and perfecting Oriental dance technique. New and challenging combinations are taught through drills and choreography until they become a part of each dancer's movement vocabulary. Students strive to improve strength, endurance, grace and agility. 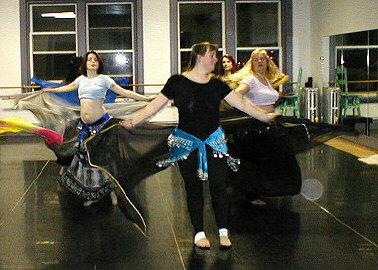 Some choose to perform, some do not, but all students learn to make their own dance creative and interesting for an audience. 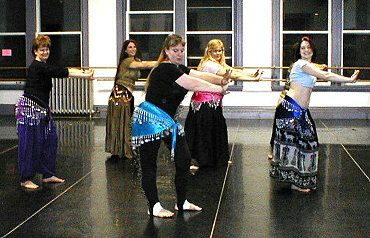 Although most advanced class students are members of the Aaminah Desert Dancers performing troupe, that is not a requirement.